What better image is there for spontaneity and structure than the birds? Students often ask me about my practice, about what a day looks like. Last February I posted my Ten Principles for Teaching. This morning I will talk about my Six Principles for Daily Practice. There is much talk about the muse, about how to get inspired, and not enough about the structure that is required to make a place for her. People think spontaneity and improvisation, even talent, spring out of nowhere. These qualities rise out of structure and practice. Freedom and play also emerge from structure. There is too much emphasis on waiting for this "first" kind of Muse, the muse of inspiration. There is not something "out there" that will get us where we need to be. This has me thinking about the second kind of muse, the one that prepares us for inspiration by providing structure. Wendell Berry speaks of the second muse as the Muse of Realization….. There is a saying most of us know, practice makes perfect. Perhaps it was our Victorian ancestors that dreamed up this saying, to promote good behavior and prolong suffering. Practice makes better, more skilled, but not perfect. Perfect is a faraway, abstract and even heartless idea. There is nothing compelling or alive about perfect. Practice is full of mistakes, of plunging in, and being willing to fail and learn. As Greg Boyle once said: "Anything worth pursuing is worth failing at." And that is worth thinking about. I opened to this line of Christian Wiman's this morning, and just reading the title inspired and frightened me. The title is, of course, a reference to T. S. Eliot's, And I said to my soul, be still. To name his poem, And I said to my soul, be loud, seizes my heart with the force of his bravery– as I could spend the rest of my days just trying to digest Eliot's Four Quartets, or even the one stanza this title refers to. Wiman's poem points us to a revered poet, while recognizing an inward need to give voice to something unconventional. 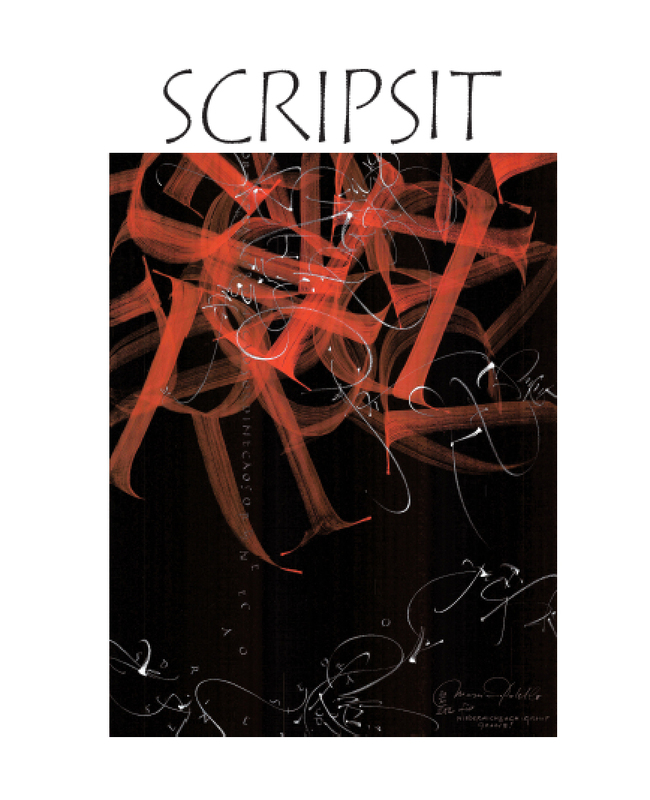 He acts on this inner urge through writing, by being willing to expose himself. It is I think, through his craft of poetry, that he finds his way. I am filled with the pleasure of seeing the students' work. It reminds me of William Stafford saying it is not my job to praise or blame, but only in the end, to be envious of your work. 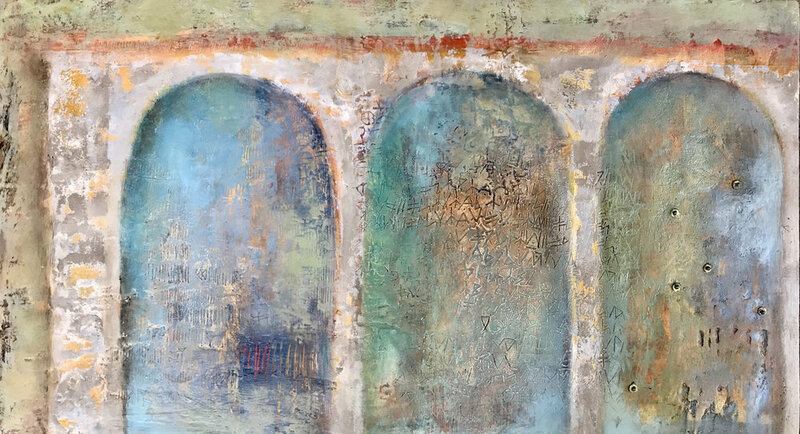 The theme for my workshops in 2019 is Quintessence: The Fifth Element. We've all heard of the ancient Greek's four elements: Earth, Air, Fire and Water. But how many of us know that there was also an indispensable fifth element, without which those four could have no ability to combine into the infinite variety of forms we see around us? the The Greeks called the fifth element aether. The medieval alchemists had a different name: quintessence. Makers are ignited by the "fifth element", the intangible something else that works through us. The Greeks provide a brilliant background for the origin of aether. Erebus, which means darkness, was the monarch of the realm of the dead. Erebus united with Nyx, the goddess of the night, and gave birth to Aether. Aether is translated as radiance: "to burn, to shine". In Homeric Greece ether meant "pure, fresh air" or "clear sky". It was "the pure essence that the gods breathed". The part you cannot see is what happens with the focus on absence and presence, the thick presence of time together without any interruptions from our pesky gadgets, and the essence and power of making a mark from this place of attention. Seeing something– your tool, a person, your hand- even for a few moments with unmitigated awareness, changes whatever it is you are regarding. The constant restlessness of wanting to get to the next moment is resolved by dropping fully into the moment you are in. The joy comes from the experience of invisible presence, from the something else that gives radiance to your work and your being. Next I will post what is coming in 2019 classes. 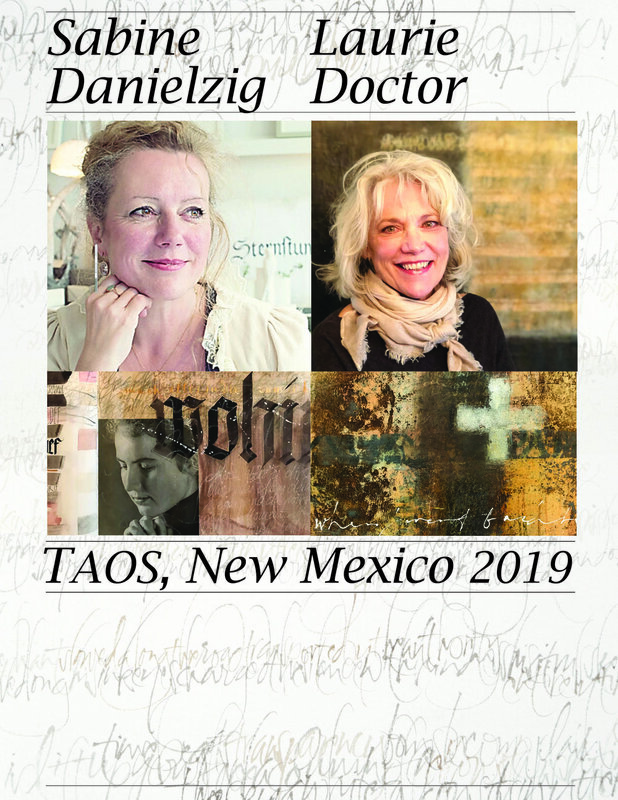 I am enthusiastic about beginning 2019 with a workshop with Sabine Danielzig in Taos, New Mexico! What are you wanting to study? I'd love to hear from you. I have tossed out several drafts since my last post. 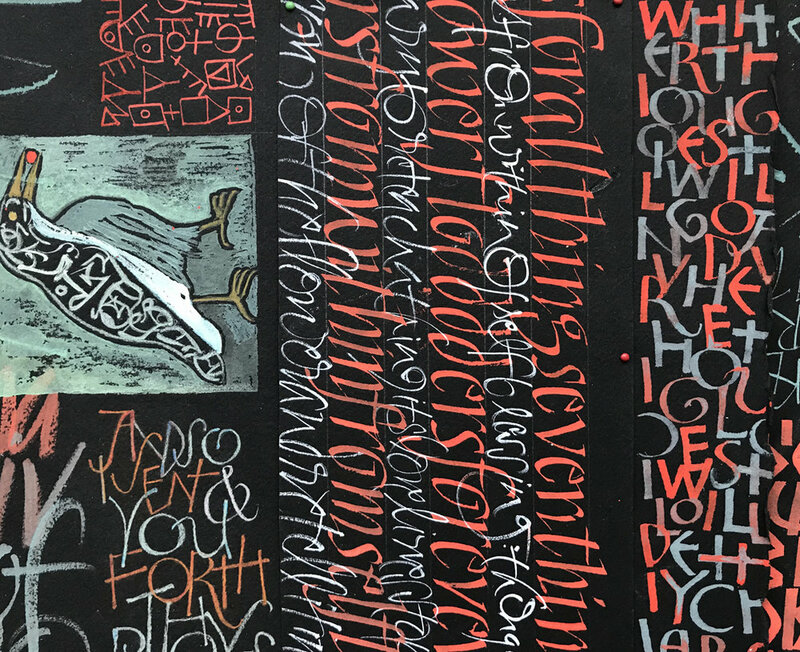 The words that come are sometimes a surprise to me, and I am still wrestling with the question I posed last time: Which word would I choose (to replace "spiritual" or "god" or "soul")? I am unable to replace them, but the word near returns. Everything I write feels inadequate, but that word near gives me a feeling of recognition. When I feel near– to my soul, my paint brush, the still small voice, the god within and without, and even my mistakes– I am free from concern about what happens next. Free from fear. Near is no longer a sense of proximity to something as much as it is a welcome home– the grace of fully inhabiting, or being inhabited. Sometimes it seems like a lot of work to get back to near. I am home from a ten day solitary retreat. It makes me aware of how much I depend on all the ways of connecting with other people– some of which elevate, and others a form of the pervasive "virtuous busyness"* in our culture, that I collude in. The only humans I spoke with on retreat were at the office, checking in, and at the end, when the gallery director and one of the monks came to look at my work. In between this time, I adjusted to not only being physically alone, but also rarely in any kind of contact with faraway friends or family. It was as if the world left me alone. 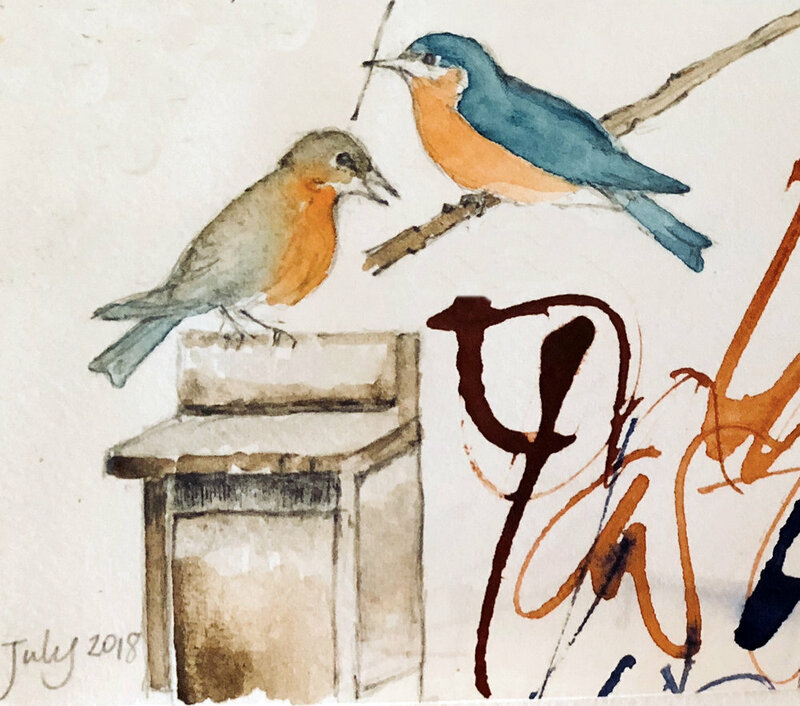 Each morning I walked downhill on a path through the woods, past the stations of the cross, past the geese on the partly frozen pond, to my studio. This abbey used to be a working farm, and where I paint was the old slaughter house. It has a tall ceiling, concrete walls and big windows looking out to red farmhouses and the winter bare branches. I discovered once again that time in the studio expands when I am slower getting there. At the end of each day I found my way back in the dark. (This may sound bleak to some of you, but I love wandering in the night of the natural world). There are many inner stations and landscapes that I visit with this much time alone. There were days when I felt like I accomplished nothing except ruining the paintings I had worked on so far. There were mornings when I came in to the studio rejecting what I thought I liked the day before. There was one day that I left the studio early, giving up on being able to make anything worthwhile. There were also moments that felt like pure joy of discovery– as if the old rutted habits of my mind finally loosened and expanded, and all the air was charged. I looked down, as if from a distance, and saw my hands operating on their own, reaching in and pulling out an image and putting it down. My hands were free from my willful supervision! This was only a rare, timeless moment– but it is the culmination and anchor for everything else that happened in those ten days. It is these moments that strengthen my desire to create and expand the structure for nearness. Find those words that make you glad, and repeat them. I find words that resonate and repeat them aloud– there is something about the spoken word that evokes a deeper connection. I also recite the phrase in writing. I have only recently discovered that this practice is similar to the ancient monastic practice of sacred reading. In our rags of light. Do you have a phrase or a poem? What draws you near? I'd love to hear from you. * I have been reading My Bright Abyss: Meditation of a Modern Believer by Christian Wiman. He is a beautiful writer of prose and poetry. It has been a quiet new year thus far, with winter storms and flu. The ground outside my window is pure white, with shadow marks from the footprints of deer, wild turkey, juncos, cardinals and Carolina wrens. In this wintry introspection, I am only just realizing that for years I have resisted my work being called spiritual- a word used frequently in our culture, and sometimes in abstract or empty ways. I am often confused, and don't wish to be mistaken for someone who has things sorted out. And yet, which word would I choose in its place? What do I call the longing to be called? To know what it is you are here for? For it isn't your work, your ability, your IQ, or your talent that sets you on course. It is the willingness to listen inwardly, and point yourself in a particular direction. You are called to action, and it is this movement that fosters faith. I am not talking about faith in any particular object or creed, but simply in the felt experience that you are part of something much larger than your "self" or your work, your family or your identity. "Prayer" by Marie Howe, from The Kingdom of Ordinary Time. Next time I will talk about my exhibit opening in April at the Saint Meinrad Archabbey. L Doctor work in Scripsit: Whither thou goest I will go. Thank you for being a reader, I value each one of you. May good fortune shower you in 2018! It is the new year, again. Much has been said about the one just passed, and some ideas about the one to come– but this morning I woke up to the new year with Mary Oliver's poem, Today. I just want to listen on this day, and see what happens.